Delhi government has decided to lay sewer lines in villages to provide hygienic atmosphere. This would go a long way in providing quality civic amenities in the villages. It was decided at a high-level meeting chaired by Delhi Chief Minister Sheila Dikshit. With the number of water-borne diseases going up, diarrhoea has started claiming its victims. At least three children in the age group of eight months to one and a half years have died of this disease in the district in the past couple of days. A dumper truck claimed another life in the wee hours today on the Surajkund road. The victim was a prominent industrialist. He was on his way to his house when his car met with an accident. He was killed on the spot. The body was later handed over to his kin for cremation. One person died and two others got serious injuries when a crane carrier hit a stationary motorcycle at the IFFCO crossing on National Highway 8 in the afternoon today. According to eyewitnesses, a crane carrier bearing registration no DL 1L-E-1578, coming from the Delhi side, hit a motorcycle. The atmosphere at Delhi University has become comparatively much more charged during the admission season. Telecom firms, private training colleges, coaching institutes and many other companies seeing a serious business potential on campus have taken to picketing and setting up stalls while admissions are in full swing. Resident Welfare Associations (RWAs) have reacted with shock at the reported survey by DMRC, allegedly suggesting that residents wanted the metro link to go above ground. "I want to meet any person who suggests that the long-term interest of Delhi should be compromised by the undue hurry of DMRC for an 11-day event," said Wing Commander J.S. Chadda of the East of Kailash RWA Federation and coordinator of South Delhi Association. Residents Welfare Associations (RWAs) today criticised the faulty development plan of Gurgaon city and warned of large-scale mess if corrective action was not taken soon. The RWAs, under the aegis of JAFRA (Joint Action Force for RWAs), a voluntary organisation, flayed the government's lack of vision in the long-term planning of the city. The National Commission for Women (NCW) will remind the Faridabad police to send the Action Taken Report (ATR) pertaining to the alleged abuse of three servant girls by a local industrialist recently. NCW member Malini Bhattacharya told TNS here today that the Commission will summon the investigating officer of the case to its office as he did not show up at the Sonepat-based Bal Gram today. A court here today sent the man who was arrested on Monday for allegedly trying to extort money from Samajwadi Party leader Amar Singh to Tihar Jail for 14 days. Chief Metropolitan Magistrate Seema Maini sent the accused, 40-year-old Lajpat Nagar resident Barun Kumar Verma, to judicial custody till June 20 after the expiry today of his one-day police custody. A local court here yesterday directed for personal appearance of start cricketer Yuvraj Singh before it on August 18. The case pertains to the alleged manhandling of a boy by Yuvraj Singh during his birthday celebrations at his residence here in December, last year. The police today filed a charge sheet against 81 inmates of Dasna jail here in connection with prison clashes in which 70 were injured in April this year. The charge sheet was filed in the court of a judicial magistrate. 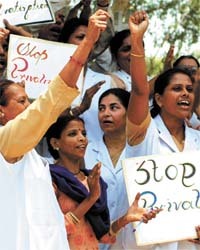 Nurses and health employees from various hospitals of Delhi demand better facilities at a rally near LNJP Hospital in the Capital on Thursday; (Right) An old woman who could not get admitted to LNJP Hospital. About 10 to 15 fire engines were pressed into service to douse the fire that engulfed the corporate office of an automobile and spare parts unit on Mathura Road here this afternoon. A 17-year-old minor girl, who was allegedly abducted by her tutor on May 3, is still untraceable despite the accused being arrested by the police. It is suspected that the girl could have been killed or kept underground by the accused. The Crime Branch of the Delhi Police today claimed to have arrested a notorious burglar, Dilip Kumar Shah (22), from Paschim Vihar. Two cases of burglaries and house theft have been solved with their arrest. Delhi government has decided to lay sewer lines in villages to provide hygienic atmosphere. This would go a long way in providing quality civic amenities in the villages. It was decided at a high-level meeting chaired by Delhi Chief Minister Sheila Dikshit. Development minister Raj Kumar Chauhan, divisional commissioner Rakesh Bihari, CEO DJB Arun Mathur and senior officers of urban development department were present in the meeting. It was decided to start laying of sewer lines in those 30 rural villages where trunk sewer line exists very near to the villages. There would be no need of acquisition of any land for commissioning of sewer lines in these villages. There would be no difficulty in laying sewer lines in another 49 villages as trunk sewer lines are passing from a reasonable distance from these villages. It would be necessary to acquire land for commissioning of ponds and mini sewer treatment plants for the rest of the villages. Dikshit has directed divisional commissioner office and Delhi Jal Board to expedite the matter relating to acquisition of land. She has further assured that there would be no dearth of funds for this project. With the number of water-borne diseases going up, diarrhoea has started claiming its victims. At least three children in the age group of eight months to one and a half years have died of this disease in the district in the past couple of days. Several persons down with the disease have been admitted in various hospitals, including the civil hospital in the past few days. The health authorities claimed to have set up some teams to provide immediate treatment to the affected persons in rural and remote areas. According to reports, the children who have become victims in the past two to three days have been living with their parents at some brick kilns near Tigaon village of Ballabgarh subdivision. The persons whose children have become victims have been identified as Jassu, Rampat, Gajender, all working as labourers at the brick kilns. Two others identified as Rupesh and Basant have reportedly moved to another place with their children down with diarrhoea, it is learnt. Though the authorities have not disclosed the exact number of persons who have been treated or admitted in the various government hospitals in the past one month, it is reported that the number of the victims, mainly the children could be six to eight in the past one month in the district. According to the public health department sources, the cause of the growing number of water-borne diseases, including diarrhoea and cholera has been the unavailability of clean drinking water and the sale of eatables in open. He said the sale of unbranded ice-creams and drinking water in pouches had been common and there was no one responsible for checking the quality and hygienic level of such items. The quality of water supplied through private tankers and hand pumps in various parts of the urban and rural areas has also been a major cause of disorders, said a doctor practising in Sector 10 here. A dumper truck claimed another life in the wee hours today on the Surajkund road. The victim was a prominent industrialist. He was on his way to his house when his car met with an accident. He was killed on the spot. The body was later handed over to his kin for cremation. A 22-year-old student died on the same road in a similar manner yesterday. 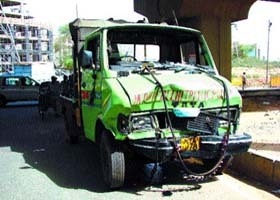 Several persons got killed or maimed in road mishaps involving trucks and commercial vehicles in the district each year. F. C. Singhal, a leading entrepreneur and businessman residing in Sector 15 here, was coming back from Delhi via Surajkund Road at about 2 this morning when his BMW car collided with a truck near an educational institute, about 10 km from here. The car was driven by his driver. Singhal was owner and partner in several industrial units here and in the region. One of his units supplied parts to Maruti Udyog Limited. The car was crushed badly and the windscreen was also completely smashed. The driver escaped with injuries. The deceased was aged about 75 years. The Surajkund road is a popular alternative route to New Delhi for the residents here due to heavy congestion and traffic bottlenecks at the Badarpur border on the main Mathura Road. The Haryana Urban Development Authority (HUDA) has spent several crores of rupees on widening and repairing of this road in the past few years. "There is an accident every third or fourth day on this route because of the heavy presence of dumper trucks moving at a fast speed and no check on the speed limit of the vehicles moving on the road", claimed Tarun, a resident here. He said there was no police checkpost or speedbreakers on the entire stretch. The road was undulating and uneven, inviting accidents if the speed of a vehicle was too much. Moving on this stretch, especially at night, was risky due to truck drivers throwing caution to wind, he claimed. Parvinder Singh, nephew of a local municipal corporator, was killed yesterday when the motorcycle on which he was returning from Delhi along with his friend was run over by a dumper truck on the same road. While the accused driver fled from the accident site in both the cases, the police failed to confirm if it was a dumper truck which killed Singhal. Though the District Transport Authority has been carrying out raids and checking illegal vehicles and overloaded trucks, the police is quite complacent about nailing down recalcitrant drivers of overspeeding vehicles. One person died and two others got serious injuries when a crane carrier hit a stationary motorcycle at the IFFCO crossing on National Highway 8 in the afternoon today. According to eyewitnesses, a crane carrier bearing registration no DL 1L-E-1578, coming from the Delhi side, hit a motorcycle. All three sitting on the motorcycle were crushed under the crane carrier. Sunil, aged 23, Amit, 25 and Satinder, 18, were on the motorcycle (HR 26-N-1442). All three got serious injuries, including multiple fractures, and became unconscious. They were immediately taken to a private hospital which declared Sunil brought dead and admitted two in the intensive care unit. Both were still critical and not out of danger, informed the attending doctor of the hospital. The situation took a nasty turn recently when conflict arose between representatives of two different companies and the university authorities adopted a tough stance. Things had become particularly ugly when representatives of the two companies resorted to violence and began uprooting banners and tents on Tuesday. Both had been allowed to picket by two rival factions of the NSUI. The police had to be called to restore order. Nakul Bhardwaj, former president of DUSU, commented recently to the press, "Our leaders have been told not to get involved in such things. We have got our accountability and responsibility towards the student community." DUSU is not authorised to allow entry of these companies on the campus. Students at large feel the admission process should not get politicised and university life be brought to a standstill through company politics sponsored by rival student political parties. Students are of the opinion that many old students who have passed out become active during the admission process and indulge in illegal activities using the name of different student bodies. The companies pay stupendous sums to student leaders to get a foothold in the university. Resident Welfare Associations (RWAs) have reacted with shock at the reported survey by DMRC, allegedly suggesting that residents wanted the metro link to go above ground. "I want to meet any person who suggests that the long-term interest of Delhi should be compromised by the undue hurry of DMRC for an 11-day event," said Wing Commander J.S. Chadda of the East of Kailash RWA Federation and coordinator of South Delhi Association. Kuldip Singh, a town planner, strongly condemned the survey. All over the world, metros are going underground, he said. "The current elevated metro has already finished the heritage status of Delhi, wasting hundreds of kilometers of land. It has already consumed land as large as the size of Chandigarh. Nowhere in the world, metro goes along with the road as in Delhi," he added. He said, "Due to elevated metro, every commuter is being forced to reach the main road to catch metro. The rural travel vehicle (RTV) buses started for metro routes have already congested the roads in entire trans-Yamuna and become major traffic problem. On the underground stretch from Delhi University to Central secretariat, there is no traffic or parking problem and is easily accessible to all." Varinder Arora of URJA criticised the DMRC for allowing malls to come up on all metro stations, particularly near Commonwealth Games village. Residents Welfare Associations (RWAs) today criticised the faulty development plan of Gurgaon city and warned of large-scale mess if corrective action was not taken soon. The RWAs, under the aegis of JAFRA (Joint Action Force for RWAs), a voluntary organisation, flayed the government's lack of vision in the long-term planning of the city. The government officials cut a sorry figure at a meeting of RWAs convened by the district administration with regard to central help for developing cities. The Centre had launched a "City Development Plan" scheme in 2005 for development of cities and towns under various projects through its funds. City Development Plan. The office-bearers of the body said that the very plan was a heap of garbage. According to it, the present population was 17 lakh. The City Development Plan projects the population to be 56 lakh in 2021. The residents' representative bodies feel it would be more than 62 lakh. Any planning based on faulty demographic figures would be wobbly and inadequate. The National Commission for Women (NCW) will remind the Faridabad police to send the Action Taken Report (ATR) pertaining to the alleged abuse of three servant girls by a local industrialist recently. NCW member Malini Bhattacharya told TNS here today that the Commission will summon the investigating officer of the case to its office as he did not show up at the Sonepat-based Bal Gram today. The girls, aged 8,10 and 12 respectively, have been offered shelter in the Bal Gram as ordered by the District Magistrate. Ms Bhattacharya who visited the Bal Gram along with a volunteer from 'Jobala', a non-government organisation, said that the Commission wants to know whether the Faridabad police has filed the chargesheet in the case. She said that their interaction with the girls offered fresh insight into their backgrounds. The NCW member said that it seems that one of the three girls rescued from the Faridabad home of the industrialist, hails from Orissa. The NCW member, however, expressed satisfaction over the condition of three girls. A court here today sent the man who was arrested on Monday for allegedly trying to extort money from Samajwadi Party leader Amar Singh to Tihar Jail for 14 days. Chief Metropolitan Magistrate Seema Maini sent the accused, 40-year-old Lajpat Nagar resident Barun Kumar Verma, to judicial custody till June 20 after the expiry today of his one-day police custody. Verma had allegedly been making phone calls to the Samajwadi Party general secretary, claiming that he was a senior law officer and could help him if he paid him Rs 5 crore, a senior police official said. The man, said to be a tutor, claimed he was very close to a central minister and a retired Supreme Court judge. He had allegedly been calling Singh and even tried to meet him when he was hospitalised last month. Singh informed Police Commissioner K. K. Paul about the incident when Verma showed up at his Lodhi Road residence on June 4, after which he was arrested by Special Cell officials. Verma has been booked under sections of the Indian Penal Code (IPC), including 420 (cheating) and 511 (doing any act towards commission of an offence). The mother of the boy took up the matter with the court asking for police action against Yuvraj and his mother, Mrs Shabnam Singh. The local court had on earlier occasions, too, had directed Yuvraj to appear before it. However, he failed to turn up due to his engagement with the Indian cricket team for the World Cup in West Indies. The matter also reached the Punjab and Haryana High Court, but the court took a lenient view because of his overseas assignment. The police today filed a charge sheet against 81 inmates of Dasna jail here in connection with prison clashes in which 70 were injured in April this year. The charge sheet was filed in the court of a judicial magistrate. All those chargesheeted were already in jail, police sources said. 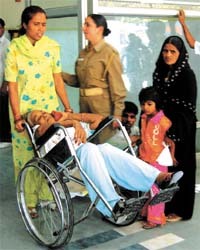 Seventy persons, including two senior police officials, were injured in clashes in the high-security Dasna jail on April 14. The search for firearms, mobile phones and other items by the jail authorities triggered the clashes. About 10 to 15 fire engines were pressed into service to douse the fire that engulfed the corporate office of an automobile and spare parts unit on Mathura Road here this afternoon. The fire department was able to get control of the fire that could have erupted due to a short circuit after about three hours. The total loss in the fire was still to be assessed. No injury or loss to human life was reported. The presence of a large quantity of furniture items posed a challenge in putting out the fire for about two hours. The flames threatened to spread to neighbouring areas due to windy conditions. The staff working in the office were evacuated safely before the fire spread to all corners, stated an official. The girl, a student of Arya Vidya Niketan School situated at Bamni khera village of Palwal subdivision, had gone for tuition to a teacher identified as Dev Raj, a resident of Gori Chant village, on the school premises in the village and failed to return since then. The accused Dev Raj had also been missing since then. A countrymade pistol along with one live cartridge have been seized from him. Following a tip-off, he was apprehended when he was going to meet a close associate, Sanju. During interrogation, it was revealed that he had come here from Saharsa in Bihar about two years back Earlier, he used to work as a casual worker for some factories around the area. Later, he indulged in burglary for easy money, said a police officer. In another incident, the South-West district police claimed to have arrested notorious auto thieves, Ashok Kumar (25) and Ravinder (23), from Najafgarh. About one dozen cases of auto theft have been solved with their arrest. Three persons were today arrested and mongoose skins worth Rs 1 crore recovered from their possession in this district. Ajay Jain and Ramesh, hailing from Delhi and an unidentified person were arrested near Loni, senior superintendent of police Deepak Ratan said.